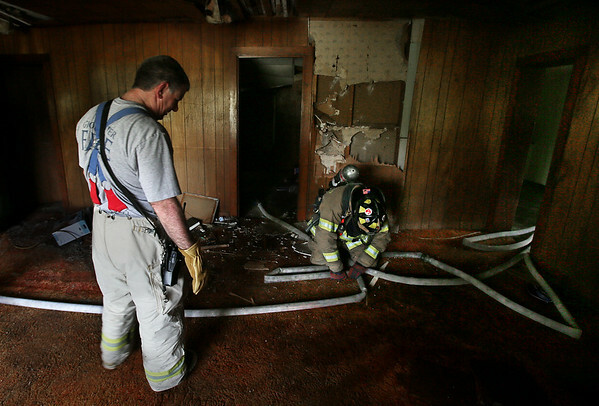 Deputy Police Chief Steve Aiello watches as firefighter Darryl Wonson does the "long lug out" drill while blindfolded in a darkened vacant house Tuesday on Woodward Avenue in West Gloucester. "Long lug out" is an easy-to-remember safety trick used by firefighters who find themselves lost in a smoke-filled building. To escape, they follow the hose line to the nearest coupling of two sections. The coupling fixture with short lugs is always on the side of the nozzle; the fixture with long lugs points the way out of the building, to safety.